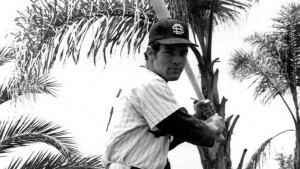 University of San Diego is mourning former Toreros baseball star Kerry Michael Dineen, who had a .409 college batting average and briefly played for the New York Yankees. Dineen, an all-CIF player for Chula Vista High School, died Nov. 21, according to USD. A first cousin of fellow former major leaguer Ken Henderson, Dineen was an All-American all three years at USD (1971-1973) and was the first Torero to make it to the major leagues — and the only one to finish above .400 as a batter. He was inducted into USD’s Chet & Marguerite Pagni Family Athletic Hall of Fame in 1997. Outfielder Dineen, a left-handed hitter and thrower, was taken by the Yankees in the fourth round of the 1973 amateur draft and debuted in pinstripes against the Boston Red Sox on June 14, 1975. “This was the night after the famous brawl when Carlton Fisk duked it out with Thurman Munson and Bill Lee suffered a serious arm injury,” Lewers wrote. “The game I saw was an exciting game in its own right. It was finally won by the Yankees in the bottom of the 12th on an RBI single by rookie outfielder Kerry Dineen. His last major-league year was 1978 with the Philadelphia Phillies. He played only 16 games in the major leagues, according to baseball-reference.com, but finished with a batting average of .324. A death notice in The San Diego Union-Tribune said Kerry is survived by his wife, Jamie, and his sons Kerry Jr. and Cory, his daughter, Katie, her husband, Eddie, and grandchildren Stephen, Emilly and Mackenna. A celebration of life will be held at 4 p.m. Jan. 23 at the American Legion Post 434, 47 Fifth Ave. in Chula Vista, where he grew up.